Finally. The vocabulary page is finally back and it is now called 'Words' section It is now better cleaner. THANK YOU DUOLINGO TEAM! We can now be redirected to the lesson where we have learned that word just by clicking it. For those of you who don't have it yet I want to share these images of the new 'Words' section. Sadly, I'm not in the test group. Judging by the screenshots only, this looks like its missing a lot of the functionality and information that was in the original. If true, that's a bit of a disappointment after months of being promised an improvement on the original. EDIT TO ADD: I was just able to take a look using a family member's account. It looks like I'm right. They took away a fabulous resource with lots of details and (grudgingly) replaced it with a sortable list. It's very disappointing to say the least. I'm on the test group. I was so excited... But I noticed its just a list. They need to add it. I agree. Conjugation practise would be really helpful. I mean, how hard can it be, the sentences are all there. Just make it fetch two sentences for every form you've learned from the database and put them together in an exercise. It can't be that hard to code. It can't be that hard to code. "A single semi-colon is the difference between glorious success and ignominious failure"(Jenkins, 2002). This has nothing to do with how "hard" it is to add this feature. Python (which I'm pretty sure is used to code Duolingo) doesn't even use semi-colons anyway! I'm guessing the reluctance to add this might have something to do with the new incubator-created languages - there might be some fundamental difference which makes it harder for them to get this data for all languages. I have no idea why else they'd be so reluctant to restore all the rich functionality that they had in the vocabulary tab before - surely it can't just be "a new design". If they could re-use the code, I'm pretty sure they would have done by now. Apologies in advance if any of this doesn't make sense, I'm operating on about 5 hours of sleep in the last 48. I have an ill toddler here that's really putting a crimp in my sleep schedule. No. I'm referring to your repeated comments insinuating that those who claim to have benefited from the old vocab tools are merely being nostalgic or claiming a benefit with no basis in reality. Your entire tone throughout this thread and others has been extremely dismissive in this way. As your justification, you point to the low utilization rate reported by Duo. However, you are assuming that a lack of utilization is equivalent to a lack of benefit to those that used these tools, when there has been no evidence offered to support such a position. I suspect that some minor interface changes could have increased utilization greatly, but alas, we've missed the opportunity to know that. I would be curious to see what the data might reveal with regards to what portion of the 6% of web users actually made regular use of the tools. (By the way, <1% vs. 6% is a pretty big swing, it's a good thing that one of us asked for a clarification rather than chosing to operate on an assumption, no?) Perhaps it would reveal what benefits, if any, those tools had upon those regular users' learning experience. Your selection of research papers to support your position seems to indicate that you've conflated two very different things. Duo's old or new vocabulary tools are not a replacement for Duolingo's inductive method of teaching. No one has suggested any changes to Duolingo pedagogical methods. They are merely a supplement to provide an additional option for reinforcing what has been taught in the skills tree. As an aside, I'm tired, and I lack the time and energy to dive too deeply into them at the moment, but the first paper seems to be on the subject of developing native-language vocabulary in children at the elementary school level. I'm not too sure how applicable a sentence grabbed from the abstract is to second language acquisition in adults. @Dessamator - For someone who demands evidence for everything, you seem awfully quick to dismiss the benefit of the old vocabulary page's features to individuals based on assumptions rather than any evidence. @Dessamator - the vocab page isn't supposed to be used as part of the day-to-day learning process, however, when there's a word that you know you would really like to practice (especially with verb conjugations) then it is (was) an incredibly useful tool. It is also useful to find example sentences if you're not sure of a word's usage. I personally feel that Duolingo was much more complete as a language-learning tool when it had the features of the previous vocab tab, and I'm sure there are others that would agree with me. > @Dessamator - the vocab page isn't supposed to be used as part of the day-to-day learning process. That's exactly why I called it a simple reference tool. People seem to want it to be a practice tool too. I hope the toddler improves, and you get some sleep. I agree we have limited evidence, some choose to go with their perceptions as evidence, I choose to go with research papers or statements by staff, and there are more detailed papers about L2 adult speakers too. New users who never saw the old vocab are probably better suited to give us insight on what they think of it. All old vocab users, including myself are likely biased. I'm sure you mean well, but please know that there are few things that programmers hate hearing more than that phrase, because it is always wrong. It is always harder to code than the user realizes. Agreed (another programmer here), however, normally with a well-designed website a design overhaul doesn't necessitate dropping of core functionality. There wasn't that much about the old vocab tab's design that wouldn't have fitted the new one, so any necessary design changes should have been minor. The point is, I'm guessing there's some deeper reason (whether that be incubator or something else) than a design overhaul for the disappearance of the old vocab page. My guess (yet another programmer and familiar with a/b-testing) is not only that they might have had to drop some features out of incompatibility with more important features, but also might be because they learned that some of the things now missing just performed weakly. There are some posts on the blog that explain how that works. ... then those are signs for something being wrong. They'd go about that by comparing different metrics (web analytics, business intelligence out of user profiles and other data) and try to figure out what is causing these declines. After that, they will see if it improves if they change the responsible feature, or even get rid of it. For a more detailed explanation of what a/b-testing can also mean (though mostly for improving conversion rates on e-comerce sites), you can take a look at Optimizely Note that it's not a tool that duolingo is using as far as I can tell. I agree as well, we desperately need the gender for nouns in German, and if the forms of the verbs were sorted or if the conjugation tables were added I would be ecstatic. It also has me wondering how much control the incubator teams, like Russian, have in customizing the new Words feature as the ability to differentiate between "Strong" and "Weak," and verb classes, and gender can all be helpful a new learner. I know Luis is not a huge fan overemphasizing old school grammarians' techniques, but these classifications can really be useful tools and help the student to discuss grammar in meaningful ways with students of other learning modes and can be useful shortcuts in recognizing linguistic patterns in other languages that are not built the same way as our mother tongue. I am on the test group too. The main missing thing to me is the gender of the words... it is necessary for every other language than English. Today there is no place on Duolingo where I can find the gender of the german word ; I need to use other websites. The great thing about the old vocab feature was that you could click on a verb, see all its forms and conjugations, and practice that one word over and over again until it was hammered in. This was particularly invaluable for mastering irregular verbs one at a time. This can't be what they've spent the last six months programming. It looks like something that was rustled up on a Friday afternoon. This must just a bit of Guatemalan humour before the real vocab feature is released in a few days. Then, as people kept complaining, they gave up and started thinking about returning it. As much as I can see, they only thought about how to make it fit the current design - that is it. I also know that they do think about the ways how to let people to see conjugations and other grammar things, will it be in the vocabulary or not - I don't know. So, I guess, your expectations were just too high. Personally, after 7 months in the Incubator, I have very low expectations and as a result I'm often pleasantly surprised. This is consistent with my own suspicions which I discussed elsewhere on the forum back in January. It's interesting to see someone with a better view into the inner workings confirm it. Your last line is a bit of an indictment of how things are handled "behind the curtain." Would you care to elaborate, Larisa? It is pretty easy; the Duolingo team is too small for all the ambitious Ideas Luis has. So, as a result we have - amazing ideas from Luis, which are never ending, he has a brain to generate them - that is his strength and passion. But Luis is not about working hard for many years to reach perfection, IMHO, he needs someone else to get his ideas to really shine, he himself doesn't have patience and moves too quickly to new ideas. Now it is a certification to destroy TOEFL, he hasn't destroyed Rosetta Stone yet but he already thinks about TOEFL, and I predict that in 6 month there will be something else not less ambitions. Which is great for humanity, I guess. On the other hand we have a very small, tiny team to implement all those ideas. The team is amazing, people are great, hardworking, friendly, smart - you name it - they are all at once. But, there are too few of them. As a result, even simplest and easiest things can wait in the queue for months. And also some great ideas would never be implemented - there is no time for that. And also you don't have any flexibility as a result. Some issues, I believe require complete rethinking of the database and approaches they use. The new ways need to be developed concurrently with the current ones, and independently from them. But they don't have resources for that. They cannot maintain some parallel system. As a result - everything as alive, whatever mistake you have - users will see it in several minutes, roughly speaking. We are working on developing Russian course and we see our new sentences leaking into the English course. That should not be the case. We've asked many times to be allowed to create our own English course for Russian speakers, without interrupting the work of the current course, but they need to first found the ways to do it, and that takes time. And we keep adding new languages to the incubator while even basic problems are not solved. Another problem is that the process is not transparent at all, Luis promised many times that we would be able to see various performance statistics of our courses - but it is still not done - again, I believe because there are just not enough people to implement that. While we do interact with Luis and the team often, there are still many things which we have no idea about, we don't usually know about their plans. For instance I don't have access to that vocabulary page either, and no one let me know (or other moderators) that it’s back. Sometimes I feel like it is a bit unfair that I have no clue about Duolingo plans for the nearest future, given that I spend about 30 hours a week working here. On the other hand - I am only a volunteer, I should not expect much. @Dessamator - very well said, thank you. @pinkadoug - I think different contributors participate for different reasons so it depends on their goals if the process is rewarding or not. Thanks for the fantastic insight from your unique perspective. Much of what you describe is about as I expected it to be. Without focus, small teams with so many ambitious goals end up getting pulled in a hundred different directions. Their efforts end up like the beam of a flashlight rather than a laser, and they encounter a lot of difficulties getting a whole lot accomplished as priorities constantly shift. Even though you have a far better view into what's going on than most of us, you're still an outsider looking in. It would be very interesting to hear the perspective of actual insiders, not that it's likely to happen (who's going to bite the hand that feeds them?). I always wonder how rewarding course mods and contributors find the process to be. It's a huge amount of work with little in the way of payback beyond the satisfaction of helping others learn while Duolingo and their backers (hope to eventually) make money on efforts of others. While I personally have no interest in learning Russian (or most other languages in the incubator), I really do appreciate the effort that you and so many others are putting into it. Your efforts will help a lot of people, ultimately, even if others are enriching themselves in the process. Beautiful, wonderful essay about Duolingo's problems and their root cause. I can probably never write as eloquently as you. Why doesn't Duolingo open the website's source code? There are already active volunteers working on new languages; I'm sure there would be others that would do the same for new features. We could use existing resources (GitHub being a prime example --- come on, it has the Linux kernel hosted there) to work on the project, and a project moderator (who doesn't need any actual coding experience, though it helps, of course --- @Luis?) or two (or three, or four, or five...) could manage the project and make sure nobody breaks anything. Of course, updates wouldn't go up live (that would be the biggest open-source nightmare imaginable, especially considering that people aren't just here to marvel at people's creation; they're using it); there would be releases and betas, just like any real program (which I've already discussed the reasons for). Thank you, Larisa. What you said is exactly what I feel after working in the incubator for about half a year. Duolingo really needs to hire more people to accomplish all the amazing ideas and ambitious goals. It's similar to what we contributors are doing—we recruit more contributors when we cannot handle the workload. Recently, I have had a feeling that I spend way too much time in the incubator—not that I don't find the volunteer work rewarding; I too enjoy all the experience. On the other hand, Duolingo is really short of hands right now, considering that they also want to enter the markets of China, South Korea and Japan. I wish the staff could see our discussion and make the right move. Meanwhile, I think we contributors should urge the Duo team to expand since we all love Duolingo. That is a very interesting insight. Summed up it seems that Duolingo's problem is lack of resources to achieve their goals. It makes matters worse when people harshly criticize them for features that have so little use (1% according to them) and take to much of their time (e.g. vocabulary). In terms of the incubator, I can feel your frustration with things that don't get implemented. On the one hand users are constantly making noise that they want more languages, on the other hand contributors are unable to develop courses due to logistics, and technical reasons. There are also others complaining about immersion, duels, and other features. It is important to take a step back and realize that for all its glory and success, the incubator is an experiment. It may work well and such mostly, but something of that nature has never been done. Some problems may simply not have existing solutions and need to be developed. This takes time and creativity which is not always available. Finally, I see that contributors are not always informed about what happens and what is going to be implemented. In Duolingo's defense, it is first and foremost a business, they are already allocating a lot of trust by revealing their plans when they show contributors the interface strings. In any other business it would be completely unacceptable to reveal their prototypes and plans to non-staff. Anyway, whatever their plans for the vocabulary are, I hope they find the creativity to implement it in a seamless and useful way. I also hope the contributors and Duolingo can find a way to efficaciously address their concerns, and enjoy their tasks. The words (not in plain sight but as hashes which referenced documents in the database, I assume) seemed to be still in the code of the website all the time. So, I guess, you're right: they just figured out a way to let it fit in. They called it "useless" or something similar. Well, this version seems to go a bit in that direction. You've hit the nail on it's head. I am in the test group, and it's lost all of its features. It's just ... a list. Agreed. I was just able to take a look using a family member's account, it's a joke that it took them 5+ months to replace it with this non-improvement. I don't care if it's just a list; it's still handy. I'd rather have it than nothing. True. It showed me for example that I have 540 out of 1586 overdue words. That's roughly 1/3 (among them allegedly buenos, buenas, buena). I wouldn't have expected this, as my tree is almost completely golden. Lists aren't all that bad. I've been studying a little over 600 new Spanish words I've picked up out of novels just by generating my own list. Admittedly, it would be nice to select 'conjugation practice', but I'm happy to see sort-able lists. @4of92, When I first saw the list I was disappointed. However it is useful in some ways. It is searchable and I like that the ability to see which words have been degraded. I had used the old list for practicing the weakest words one by one. The other information on the old list is available on other sites. Some nice person here generated a list of Spanish and German. I downloaded it and I use the Spanish one a lot. The Duo part went away, but I still use the other information included on his list. Yeah the new one is not as rich as the previous one, but it is still handy. I made those lists. I'll probably be updating them next week to replace the now-broken Duo links with links to other resources with conjugation tables, as well as a few more German skills,so keep an eye out for those. That is fabulous. Thank you! I did find one improvement.. it loads all your vocabulary at once. It could take forever for the 'active loading' to load 30 or so words at a time. Yes, I was about to comment on that as well. It's a nice improvement over the old way. I would also add that I really do like the look of the new implementation, regardless of my other complaints. Then again, I was always a fan of the new design, so I guess it's not surprising that I'd prefer this look to the old. It does seem like their efforts (however well meant) to simplify and "modernize" the website are trending towards a downgrade in quality. But, that's what we're here for, to provide the feedback. At least they decided to test it first (cough, new Immersion, cough). I really feel like they don't care about our feedback anymore, if they ever did, honestly. =( Other sites half as useful as Duolingo can implement this feature, it's such a standard now. Expected, even. The whole 'team of 32 people only' excuse is wearing thin. This is the most popular language learning site online. They can do more. Just pretty disappointed. I feel bad for complaining so much, but I've always praised this site so highly and recommended it to people whenever the topic of languages came up. Just seems like they've spat on their community with this one. The users made it so clear what they wanted. Don't let it bum you out so much. In spite of their shortcomings, Duo is still light years ahead of any alternative. I think it's more of them caring a little too late. It's also possible for them to run a survey and ask questions and show rendered pictures of possible new features BEFORE launching an AB test so that they can begin incorporating the feedback right there and then. The problem is that they are not cutting us off at the fork of the new idea, but letting us wander paths and hit some obstacles beforehand. This approach doesn't work for everyone, and that is why the community has so much negativity towards any new feature. But, I definitely agree with the second paragraph. Everyone chatted for months on what they wanted to see, but that's not what was presented. IMO (as I can't speak to the amount of labor that went into the test version), Duolingo should have simply updated us on everything, waited a few more months to bring all the features into the new version, and then released an AB test. As far as I know, the new immersion layout is an AB test as well. I don't have it, nor does anyone else in my family that I know of. Hey Aliciaftw- We mentioned in this thread that this was not simply a list that was created. It involved a lot more than that due to the complexities that were added to the backend of Duolingo over the past year. It's a test, and we'll see how it goes! Understand that from the perspective of most users, you've merely replaced a fantastic, multi-functional vocabulary tool with a simple list. I, and I'm sure many others, understand that back end changes are what drove the delays. That is made abundantly clear by the final product since rendering a sortable list of vocabulary using existing hover hint functionality is a fairly trivial task. While I'm sure that the back end changes make life far easier for the developers and the course contributors/mods and that it will allow better integration across platforms, it leaves the average user without the most useful functions of the old vocabulary tools. Are there plans to reintroduce the missing features (word detail pages, conjugation charts, etc.)? If so, which ones? When? If not, can you explain the rationale behind removing them? Pinkdoug- Yes, so to be transparent- less than 1% of all learners used the functionality you're describing from the old vocab page. I find it super hard to believe that only 1% of Duo users use conjugation tables and a detailed dictionary. They are almost constant in other language learning tools and super useful. There are websites that present that information better than the old vocab page, and I'd wager people simply turned to them. I hope that in the future Duo decides to return these features in a more usable format. Edit: wow so this doesn't even list the gender of words?? According to statements made by Luis, the majority of your users are on the two mobile platforms that you support. Of course, neither of those have never had vocabulary tools. What percentage of web users used the vocabulary tools? I'm confused - you're asking for our metrics, but before we even produce them you're saying that if they don't fit what your expectations are/opinions are, then we're lying? Your choice whether or not you want to believe the following, but there is no real reason to falsify information here. If the metrics seemed to indicate that making a much more extensive vocabulary page would have been highly beneficial, then our choice would have been easy to make. Unique by user, around 6% of our web users ever opened a word page - word page being the page with the single word practices, example sentences, conjugation tables, etc. All the aspects missing from the new implementation. Please try to keep in mind that our goal is to make a better experience that our user base enjoys using and learning with. We would only be hurting ourselves by negatively impacting your experience. You can disagree with the methods or findings and definitely please stay vocal about your opinions and feedback, but implying that we're somehow trying to be malicious about it seems silly. Thanks! The metrics do not always tell the truth. Whether the feature and the sub-features of Vocabulary are beneficial, unfortunately, should not be determined by how much percentage of users open them or use them often. Instead, it should be related to users' performance in their skill trees—how far has one gone down the tree and how many Immersion articles one has translated. Vocabulary is like the watches we wear: we do not always need to know the current exact time and look at our watches; similarly, we do not always have to refer to all the conjugation tables if we think we know them well. However, watches should never thus be in idle mode and stop ticking, and Vocabulary is out of no doubt a must-have-feature of Duolingo to assure users that their vocabulary questions can be solved. @bchan - I apologize, that was not the impression that I intended to give, although upon rereading that post I certainly did send the wrong signal. That's my fault. I was merely trying to say that in the end, it comes down to whether or not we trust what we're told by you guys (for the record, I do) since only you have the actual data to analyze. We either accept your answers or we don't. I appreciate your answer, although it makes me question whether the underutilization of those features was not due to the tools not being worthwhile, but instead due to many users being unaware of their existence. The reason for this is that that you say that the vast majority of users never even saw a detail page once. I've seen many users claim that they were unaware of them. If that's a common situation, perhaps improving the tools' visibility was the better course of action. Unfortunately such efforts were not undertaken prior to the wholesale removal of these features. Clearly they were of great value to those of us that did use them. Tangentially, let me mention another reason that you should have this information easily accessible on your website. Not having it available here drives traffic to other sites. 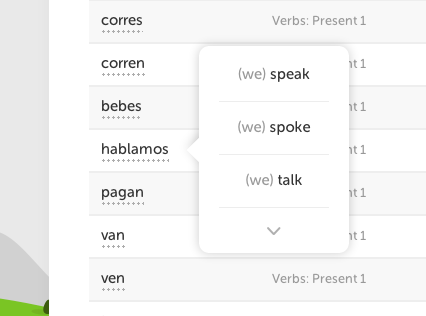 For example, I wonder how many Duo users have subscribed to SpanishDict's Fluencia service after seeking definitions, examples, conjugation tables, etc. at that web site. Rest assured, that I've never had any doubts that the Duo team's goal is to deliver the best solution, even if I do think you occasionally miss the mark. Complaints about this issue aside, I hold the entire Duo team in the highest regard. "Malicious" is a word I've never associated with anyone there. If only web users had the vocabulary tab, then obviously it is less than 1% of all web usersor 25% ( at least last time I heard) of all users (from all platforms). You're making a bit of an assumption there. She said 1% of all learners. She did not qualify her statement with web users. You're assuming that this was her intent, but it's not at all clear that it was. This is why I asked for a clarification. EDIT TO ADD: Of course it doesn't matter ultimately because they can tell us any numbers they like. We don't have access to the data to know whether it's accurate or not, and we can only take their word for it. It's their baby, and they're free to make the changes they wish and to use whatever justification (nor none at all) that they please. We're free to ask questions and voice our concerns and opinions. @pinkodoug I think that statistic would be much more meaningful indeed. Of course, they don't owe us anything, so I don't expect to see it. 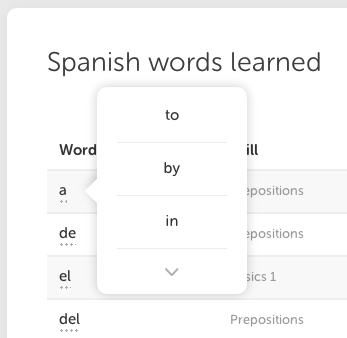 I am very thankful for Duolingo as a whole, and the team behind it (as I know you are), but if those features from the old vocabulary tab are never reimplemented, Duolingo will be lesser for it. Any more detailed stats? I'd love to know how usage or usefulness of certain elements changes based on starting or target language, starting proficiency if possible, progression in the tree, frequency of practice, those kinds of things. A huge chunk of Duo users is learning English, of course they would never need declension and conjugation charts. As I mentioned in a lengthier post somewhere bellow, usefulness of different elements is not the same for every language (and at every stage), and German in particular would profit immensely by having a place to practice or review genders of nouns. I hope the people charged with interpreting the numbers from testing are also learners, and have an understanding of the why's that might be in the background of something seemingly surprising? I wonder if this was due to users not knowing these features existed. Usagiboy7 mentions that one regret they have about the Vocabulary feature was not having knowing about it soon enough... I wonder how many other users fell into this category. Then let's hope 99% of users in the test group will use it, even without the full (old) functionality. I'll start right now, although I'm a little disappointed, too. But at least it's back. How many times have I had to brag to people about those features because people did not even know they existed? It was unfair to judge the vocab that way when users did not know what they could do with it. If more people knew what the features were and how to use them, it would have been used by everyone. Word of mouth was just starting to spread when ZAP, they decided to change it. Was it so much better in some languages than others and you wanted to enable some of the languages which had less? Which is why I always wrote "in some form" when talking about its return. DL never said it would be improved, and based on that, I figured it probably wouldn't be. I'm more annoyed with the users who kept going on and on about an improved tab, with no real knowledge to base that on. I'm sorry to be proven correct in this case. You're absolutely right that it was never explicitly stated that the replacement would be an improvement. However, I don't think it's unreasonable that users developed an expectation that after an absence of nearly 6 months it would return in a form that wasn't a regression in terms of features. The more time that passed, the greater the sense of "well, it must be something good if it's taking this long," is fairly natural whether it's warranted or not. The fact is that a simple sortable table with hover hints is a trivial bit of work, and it could have been included at the time of the interface changes with a minimum of additional dev effort. All of this kind of goes back to how Duo has communicated (or not, as the case may be) with the community on the subject in the first place. Expectations could have been managed better, and details about what features wouldn't return could have been stated as well as their reasons for these decisions. Nearly six months ago, Luis promised greater transparency in how these sorts of decisions are made, but it's all still shrouded in secrecy. Hi pinkodoug- We appreciate your feedback. With a small team of 32 and lots of new updates happening across all platforms (Android, iOS and web) we had to re-prioritize. Recreating the vocab experience involved not just a new design, but a new infrastructure to support it due to all the changes Duolingo has gone through in the past year with adding the new Incubator courses. Unfortunately, it wasn't as simple as bringing back the old page with an updated look. Appreciate all the support and thanks for understanding. This is currently an AB test that not everyone has. We're seeing how people like it! Kristine, the problem is that Duo has not recreated the vocabulary experience, but redefined it instead. Virtually all of what made the old vocabulary page useful has been tossed in the bin. I fully understand the fact that many of the changes on the back end are invisible to users and can force any number of changes to the front end, and that implementation delays can occur accordingly. I've said this several times elsewhere, but to be crystal clear, the issue that I have had with Duolingo's handling of the "vocabulary situation" is one of communication, or rather, the lack thereof. You yourself promised to keep us updated with your progress, but there were no such updates. When you guys missed your commitment to deliver in Apr/May, there was not a single peep from anyone at Duo about it until users started complaining. Then you gave a quick response along the lines of "we're working on it, I'll keep you updated." So much of this could have been avoided by simply communicating, but for whatever reason, that is an option you all have chosen not to use. If the users had been given an expectation that when - finally, after 6 months of absence - the Vocabulary page would be replaced with a simple sortable list, stripped of its useful features, perhaps people would not be disappointed now. Managing the expectations of the users is an important aspect of communication. I think, that it is again a matter of resources. You need people whose job is only to communicate with users, that's how much time it would now require. The same with the Incubator contributors. When we started - there were only handful of us - we all chatted together with the Duo team and Luis in the Incubator chat. But with more and more contributors it became obvious it wasn't the way to go. So now we have mentors - people who act like a middleman between the Incubator teams and the Duo team. I think that was a right decision. However, communication and transparency are still very big issues I must say. There were many cases, where Duo plans were not communicated properly and created misunderstanding. Here is a couple of examples. We started seeing in the Localization strings about paying for the certifications and other "money" messages. No one understood what they were, and some people started worrying about the Duolingo profit and volunteer share and so on. Those worries made some people unhappy and less interested in the work we do. They could be easily avoided if the Duo plans were more clear to us. Another example - not long ago we were informed that we don't need to translate the interface any longer, that they would translate it "internally" - no other details. Obviously people start to speculate - ok, it turns out they outsourced it to some other company. I think - it was wise, because we, volunteers, could not keep up with it. But why not communicate it more openly? Maybe, because there is no one to sit and develop a communication strategy, I don't know. All this looks like a rapid growth problem. The project has grown much faster than the team could adapt to new challenges. They must slow down - but... there is no time for that. Hey pinkodoug- totally understand where you're coming from and again, definitely appreciate your honest feedback. We want to keep the community up to date and informed- unfortunately, the project has taken much longer than originally anticipated. Next time, we'll make sure to mention delays and give more realistic timeframes. Thanks again for understanding! pinkodoug knows what he's talking about and does an amazing job. Bravo! @Larisa_L - I expect that these problems brought on by growing too quickly for them to keep up will be exasperated as they continue to get new funding from various VC groups. Pressure from outside sources to deliver will steadily increase. 9 lingots here. Well said. @Zach1337 - haha - thanks. More for my fat stacks. Just wondering - if the team concludes that people don't like this form of the vocab page, will the next step be to try and improve it, or to drop it entirely? Perhaps the only conceivable way Duolingo can keep up with the services required is to develop an API. It may greatly remove the weight on Duolingo's shoulders and place it upon those who claim to love this platform, and have sufficient skill to improve it. I know that Duolingo has stated in the past that they haven't had any plans for it, but the fact is that the more time that passes the more features that will be developed and the harder it will to create a resonable API. An added benefit of APIs would be that there would be less focus on asking Duolingo features that could be easily developed by third parties such as these vocabulary add-ons that people "want". It could also serve as a distraction for users so Duolingo can focus on what it does best. Considering that the Duolingo mobile app requires an internet connection, chances are the most of the API has already been developed for internal use anyway. In any event, people will most likely create scripts, and extensions to pick up the vocabulary data even if Duolingo doesn't sanction or support it. I don't (in theory) disagree with anything you are saying. But it is the exact lack of transparency that led me to believe we would be getting a lot less then most people were expecting. I agree. In fact my earliest post on the subject back when the interface changes first rolled out to the whole user base, as well as some of my subsequent posts on the topic, have expressed the same skepticism. In recent weeks, I've been guilty of allowing my own expectations to creep a bit in spite of knowing better. We still believe that learning a language largely depends on having a huge vocabulary, and once we come up with a good way to integrate it across all platforms it will come back. Perhaps it also will be launched in other platforms soon. In addition to integrating it into all platforms, they need to be able to integrate it into all the languages including the budding ones in the incubator. I can't imagine that's any small feat either. I suspect that's why there's limited functionality with this test group. That's the functionality that they could support across all languages and platforms. Hopefully in the future, they'll be adding more functionality as they are able to come up with a way to do it that scales to all languages and platforms. I see what you're saying. The old version does have a lot more...guess this is another simplification feature for Duolingo. I agree with you about the poor functionality of the current form of the vocabulary feature. I assume this is their first pass. Although the missing of individual word page is a huge disappointment. I know this will be down-voted - and I am ok with that. But: The number one reason I am happy about this, is that it puts an end to 10 discussions per day on the vocab tab. I am so happy, here is a lingot and an up vote just for you. Your reasons do not matter. In every lesson there is always one word that is harder to spell or just does not "click" that needs extra practice and yet it rarely pops ups in going over the lesson. DL is all about doing things at your pace, not some one elses so individual words are only used at our pace. I cannot wait for it to get out of beta. My problem is with normal timed practice I always, without fail (it may be a bug), get the sentence Wie viele betreiber sind wir brauchen in both german-english form and choose out of the three boxes when it could be used to strengthen things I actually need. I gotta agree with you there. Time to delete my word document with the format explaining about the vocab tab that I can copy and paste into Duolingo. But I assume, there will 5 discussion complaining they are not in the test group, the remaining ❤❤❤❤❤ about the lack of features. Both valid reasons. And, yes: I am in the test group (no the biggest fan). Guys, if you aren't in this group, never mind, really! I'm in the test group, and I can already tell I won't be using this, not because I don't want the extra practice, but because its current form isn't helpful to what I need. Going through lessons introduced me to new words (within a context) slowly enough that I'm pretty sure I know the meaning of more or less all of them, but its their genders (and occasionally forms) I have trouble with. I know Fenster is a window, and I know a window belongs in the household, so I don't need reminders for that. What's its gender? I have no clue. Despite "Words" tab saying that that word is at maximum strength, I would still fail to decline it if I were given a sentence that required that. Like a lot of users, I was really hoping we'd get genders shown here. I probably wouldn't have been using vocabulary assistance for Spanish in any case, because, with rare exceptions, I know the gender of a word as soon as I see it, but it's the most painfully needed thing in German. Knowing how articles change in Dative serves me no purpose if I don't even know Nominative, and there is no way to select just nouns and practice those. I was thinking of quitting the course completely before I discovered Memrise, since this was holding me back and was a constant source of frustration. Couldn't it be possible to make word practice simply the selection of those pretty little exercises where you get the picture, and need to type in the article and the word? People learning Spanish from English, or English from Spanish (who, I believe, make the majority of Duolingo users) will never encounter this problem, so they won't have trouble sticking with just the regular practice, but if the decision making gets based only on the "majority of users", without considering specifics of each language, some language courses will never be fully functional and as good as they could be. 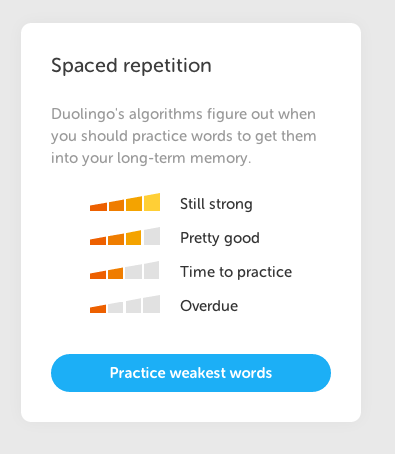 Which reminds me that although I've seen Duo staff mention either 1 or 2% of users used the vocabulary option, I've never seen anyone give any details of how it changed based on starting/target language, frequency of practice, or skill level reached. I would personally love to see some more in-depth statistics. Bring back the ability to practice individual words. This is for when SRS or Duo are judging MY knowledge poorly. The system can think one thing while reality is another. Just because it thinks I know ihr back and forth doesn't mean I do (and trust me, I don't). We need individual word focus/practice. Bring back example sentences. They helped so much that it cannot be overstated. Gender. Gender! We are tested on gender, many languages require gender. Show the gender. Finally, a concern about the "test" of this new functionality: if the list is lacking much of what people would use it for, of course a test of reception is doomed to failure. When it's not used much, will the team at Duo conclude that we're just not interested in it afterall? "Less than 1%!" Or will they understand it's not very useful in its current state? I'm glad I made personal vocab lists on Memrise. I suspect that as long they find that this feature isn't detrimental, it will stay just to avoid the inevitable barrage of complaints if it were to go away again. It appears that they only implemented this list now to placate those of us clamoring for the return of the old vocab tools. Given the lack of the old vocab tool's most useful features, I doubt the current incarnation makes much of a difference to their metrics one way or another, so everyone will probably get the current version. The lack of measurable benefits, however, will be used to justify future refusals to put any dev effort into the tools. On point! I must say, pinkodoug, your comments are highly insightful and pithy. ¡Siguen con el bueno trabago! Personally, as a data analyst, I would like to see the numbers myself to make the correct conclusions. bchan said that only 6% of Unique users used the Vocab page. But Z.Shan pointed out correctly that one metric doesn't tell the whole story. Who are those Unique Users? We have more than 600 thousand users in our Russian course, but most of them take 1-3 lessons, write some nonsense in the discussions and leave the site/app forever - I don't care about those users even a bit. I care about those of our users who come regularly. Some of them are advanced, some of them are beginners, some move fast, some move very slowly, but they are all regular users - and for them I want our course to be really useful. And I'm sure that many of them loved or would love to use the Vocabulary with some grammar info attached. And we are developing Russian course now - believe me, any users of that course would need to consult cases tables and gender hints regularly. And then again Z.Shan noted correctly that most of the users are mobile users and they have never had the vocab page - the could not use it by definition. How about them, were they included in the count to find those 6% or not? Or maybe that is where less than 1% came from. Recently we were given a chance to write grammar hints to skills, but they are not visible to most of our users - those who use mobile devices. Those users ask us to add the grammar tips every day, we answer the same grammar questions 100 times a day - but we have time for that and Duo team does not, so I guess we'll just keep doing it. When I ask Luis about some changes in the Incubator he often tells me - you know nothing, you don't have all the data we have, you cannot know what users need. Indeed, as a data analyst I would agree that if I had that data I could gain much better understanding of my users' needs. However, while I don't have all the data, I read and answer in the sentences discussions each and every day - and I can see many things without help of any data. There were several cases already where I would bother our mentor that there was some technical issue, some bug, that users got some incorrect exercises and things like that, and our mentor would not believe. Everyone would try to persuade me that our users didn't know anything, that they just made mistakes and complained about nothing, just to prove they were right. But as a regular discussion reader I can tell the difference between stupidity and a real system issue. And after a week or so of going back and forward and trying to find solid proof it always turns out that I was right. If I had the data - obviously I would prove it faster, but we have what we have. My point is - when they say that no one uses vocab - our data shows that - I'm sceptical, because according to the same data our English-Russian course is almost perfect and could leave beta months ago, while I have a completely opposite opinion on the matter (and our regular users would definitely agree with it). We have more than 600 thousand users in our Russian course, but most of them take 1-3 lessons, write some nonsense in the discussions and leave the site/app forever - I don't care about those users even a bit. I care about those of our users who come regularly. Some of them are advanced, some of them are beginners, some move fast, some move very slowly, but they are all regular users - and for them I want our course to be really useful. Exactly the same for our course. We have more than 1 million users and we have the same phenomenon. Judging from the popularity of our forums and the activities inside, I can conclude that we have fewer than 100 users who are extremely dedicated web users (who participate in the forums). And unfortunately, Luis won't be able to tell from the metrics. I would say more than 100 dedicated users, but maybe more, given all the popularity of this site? By "dedicated web users", I mean those who will comment on sentence discussions or other discussion posts. Otherwise, I won't be sure whether a certain user is working on the course on the mobile app or on the web. I have an "Active" tab in the forums to monitor all threads being commented on and I deduced the number from that. @Z.Shan, we lock the sentence discussions connected in the lessons when we start seeing massive repeats of the same comments, questions and answers. Basically, when the topic has been exhausted. We were getting single sentence discussions in which it would take myself and another moderator an hour to clean up because of all of the redundancy. That is when we received the "Lock Discussion" button. @Usagiboy7, Z.Shan was joking obviously, yes, of course we lock some discussions, I've done that, I'm almost sure Z.Shan himself has done that. It is a useful tool in some cases. The joke is rather about using the numbers to make some big decisions, according to our estimates all discussions are used only by minority of users. EDIT 1 PS One thing Dessamator and I observed about forum usage is that this poll announcement https://www.duolingo.com/comment/3357580 received 29 upvotes and 31 comments. Meanwhile, there were at least 165 people who took the actual poll. Agreed. I know I personally read sentence discussions right from the start, but I didn't begin commenting there or on forum discussions until relatively recently. Being dedicated to the language-learning aspect of the site doesn't automatically mean visibly participating in the community aspect. I'm sure there are massively more inactive users registered to the site than active ones, just don't think the active user numbers are quite as low as forum participation alone would indicate. I'm sure there's a not completely negligible web-based group that takes lessons, does immersion, and may have used vocabulary back in the day, but just doesn't post in the forums. If they're web users who never comments/posts, they're highly similar to mobile users, aren't they? And I believe there is definitely something wrong going on when so few people participate in forums, considering that we have more than 1 million users. That is true, I almost never wrote in the Discussions before I became a Russian course moderator. I read many of the discussions, while I'm going through the exercises. It helps immensely for at least two reasons: 1. to see that others have the same questions; 2. quite often someone will have posted a detailed explanation or a helpful link. Duolingo cannot be all things to all learners. I think of the discussions as a way for us to help one another. The Chinese forums are relatively new and there are few comments in sentence discussions for you to read, let alone the grammar explanation comments. Mainly the comments are "why is XXXXX not acceptable?". Most of them don't report errors to us and they leave Duolingo and never come back. On the other hand, if my definition of "dedicated web users" seems a bit discriminative, sorry. bchan said that only 6% of Unique users used the Vocab page. But Z.Shan pointed out correctly that one metric doesn't tell the whole story. Who are those Unique Users? We have more than 600 thousand users in our Russian course, but most of them take 1-3 lessons, write some nonsense in the discussions and leave the site/app forever - I don't care about those users even a bit. This is a great point, and I'm a bit embarrassed that it didn't occur to me (I'll blame my sleep-deprived state the last couple of days). There are millions of inactive users, who log in to see what this site is all about, and never return after completing only a lesson or two. Including these users in any measurement of the old vocabulary tools' usage will render the numbers useless. I'd be very interested to know what percentage of unique active who accessed the old vocabulary tools, and what percentage of those utilized them regularly. I suspect that those numbers might reveal a very different story than the company line. I'd like to see the data, too. Or at least know how they were captured etc. No a professional data analyst but a number-loving users (being capable to do some 'low-tech' stuff as 'regular' statistics and machine learning). Thanks for bringing the vocabulary feature back! I only have an issue: I just did a 'Practice Weakest Words' (I have 2 weak words in German) and the twenty questions didn't use any of my weakest words (I ended up scoring 18 points). Could you please check that? It feels like the 'Strengthen Skills' feature. Is this algorithm taking previous mistakes into consideration too? Thank you! ps. I added an issue in the troubleshooting section. "Practice Weakest Words" and "Strengthen Skills" are two different names for the exact same thing. Both links refer to the same feature. This is also the way it was before the removal of the old vocabulary system. What I'm about to say is what I've learned from conversations with one of the devs during the time that I've been on Duo. This was explained to me several months ago by Tatou, and it's possible that things have changed slightly since that time. It is, however, accurate as far as I know. The process for choosing which words get exercised in a drill will not select the weakest words if their strength rating is above a certain percentage (roughly 75 or 80 percent). If there are not enough eligible "weakest words", the algorithm chooses words with the greatest "last practiced" date instead. That's strange. I exclusively do the "Strengthen Skills" feature, and while I have words that haven't been seen in over 5 months, I constantly am given the same sentences over and over again during the practice. I'm not really surprised. The entire system for calculating word strength, decay rates and for selecting words to strengthen have always been a bit buggy. Last fall Tatou spent a lot of time trying to locate and fix a number of these problems, and every change seemed to reveal a different set of issues. What I described is based on his explanations of how things are supposed to work, and they generally do 99.9% of the time. There are, however, plenty of examples where there's still some quirky behavior due to some bugs lurking. 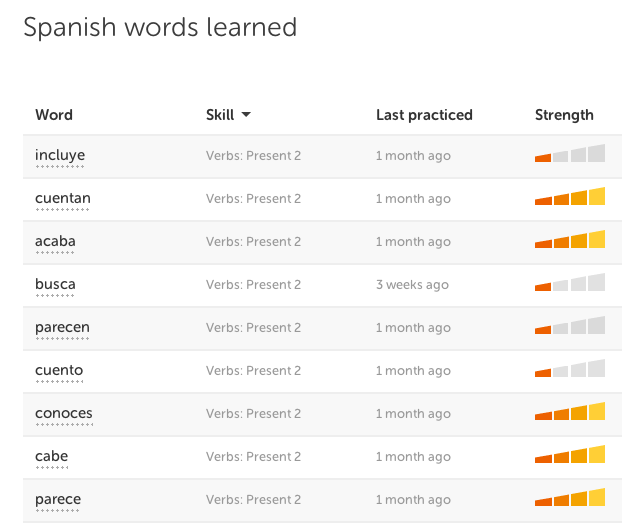 It's also harder to identify which words are being selected for strengthening by the practice tools now that Duo no longer shows you which words were targeted after a practice session (for those that don't know, on the old site design, after each practice users were shown a list of words that the practice session targeted for improvement). Then it's still buggy because both words were bellow 50%. Otherwise they should definitely change the label to 'Practice words' instead. I have the same problem. I'm in the test group for the vocab page, and saw that hal the words in my "Verbs: Present 1" skill were over 7 months not practiced and at overdue. I did the "Strengthen skill" until I was at over 13 words still so bad, and since then I'm lucky to get one of the lacking words per one go through the skill. That's actually what I used the old vocabulary page for, mostly - Seeing what skills I needed to repeat since the "Strengthen Vocabulary" is very buggy for me. I'm afraid now that vocab is less useful than before, people will use it less and the staff will use that as an excuse to remove it forever. Maybe that's just me being gloomy, but the way this feature has been treated, it seems to me that they just want to get rid of it. I have given up on vocab now. A while ago somebody recommended Lingua.ly and I've started saving my new vocabulary to that. It works well and I don't have to wait for poorly communicated changes/"improvements". About time too... I mean "wow that was quick, barely noticed it gone"
I too miss the conjugation aspect of the old Vocab feature. I hope they add a conjugation practice to this feature. Though, I imagine it could take time to crunch data on the new iteration. EDIT 1: I do like the simple design of it though. The last one was a little more complicated and I didn't even know several features on it existed for a long time because I didn't know there was anything extra to go hunting for. That was the main downside of the previous version for me. I miss the individual word practice. The Strengthen Skills feature has always been a bit buggy, and back when the old vocabulary tab was available, I was able to strengthen words that (for whatever reason) didn't improve on their own. Now that I can see my stats again, I noticed that I have over 10 words (at one bar) which I haven't seen in 11 months. (Example) In Spanish, I see the word nado has not been seen in 11 months. I tried going back to verbs: present 1 to see if I could snag it, and it didn't come up. Now, I'm stuck. I don't want to keep doing this lesson hoping to randomly come across this one word. @wazzie, I like simplified, but not necessarily because they lack those features. I would happily have those features back but organized differently so that if I went back in time, I wouldn't have gone so long before finding them. Other than loading the entire list rather than 20 or 25 words at a time, the only real difference between the current format and the front page of the old vocab page is that there's one less column. Rather than grouping every word form by its lemma, the lemma column is now removed and everything is listed by form instead. Otherwise, the page is just presented consistently with the new interface. I like this particular change, but all of the other useful functionality was contained in the word detail pages that are now gone. When I first used the old tab, I didnt´realize i could click the headings to bring all of my weakest words to the top, etc. (The ability to click the headings is still not very obvious at this time. I only knew this time around because I accidentally found it last time.) I hope Duolingo makes that more obvious. That's because they aren't there. I'd suggest making a Memrise, Anki or Excel list of your own. Just found WORDS in my menu. I'll poke lots of buttons so Duo will have tons of data. Almost finished with the German tree and will be starting Spanish. héatherblanca. 2) It is that way by design. The only way to immediately strengthen a word is to use timed practice. To your 2) : That would be helpful if I got the weakest words if I do that. The last three times I used strengthen skill and timed practice on my present verb forms I was lucky to get one of the 13 overdue, not-used-in-over-7-months words, instead of the ones I had practiced just minutes earlier. Having a vocab list without genders, plural forms, etc. is just silly. It's back! I just noticed it but didn't decide to take a look at it. I'm really excited right now! Yes, thank you Duolingo team!!! I have 2 accounts and I am happy that one of them has the vocab back! I used it a lot. I'm happy to see it again! Still, it's back, and we can at least see what words we must strengthen. It's not as functional, I agree, but it is what we've been waiting for, and it has some good features. You can tell how long ago you practiced, the strength, what skill it is in, and it tells a definition of words. You can also practice weakest words. So, it's not as good as it was, but I think we should take it. Duolingo worked hard! You can see the words, but you cannot actually strengthen them any easier than before. Strengthen Skills and Practice Weakest Words has the same functionality. Yes, that is true. What you can do is see your weakest words and review them, either just mousing over them, or making Anki decks of these words. Duolingo is showing you the information, not giving you the practice (yet. Maybe they will add it, because people seem to be disappointed). I think its a little bit more basic than we all expected when taking into account how long it took to arrive. It could be improved a lot just by adding a conjugate button for verbs and gender for nouns because I usually don't have trouble with spelling nouns, I have trouble remembering their gender which in German is critical for forming sentences correctly because of the cases. It's been mentioned before about "gain something, lose something" on Duo. It seems the old vocab db entries for individual words are gone (or at least not accessible) now. It's now a blank DL page. Example sentences, conjugation, individual word practice -- we've lost more than we've gained. I like it! Code is like building blocks, and this is a good foundation. I think anyone used to the original "Vocab Tab" would see this as a gross dumbing-down! It's just a list of words. Are we as Dlers getting thicker in our dotage? Does DL keep having to panda to the simple? I don't know. Why no words page for Norwegian? Thanks for posting. Can't wait til it gets out of Beta and I can have it. Necisito esto mucho! Muchas gracias Duolingo! I'm glad I read the discussions first. I did not notice it! I never had the pleasure of using the last vocabulary here, so I can't wait to try it! Ciao! Just checked it. I really love the practice for the weaker words, but I definitely want to see the list...shrunk some how. It is way too long, and I haven't even reached halfway yet! It takes minutes for the page to load. Perhaps make certain categories, tabs, something to make it a bit less laggy. Otherwise, I love it. Thank you Duolingo team! By minutes do you mean actual minutes? Or just in general a very long time? Thanks! Yes, actual minutes! The page is so long is slows down my !!!! computer! Strange, it loads in 3 seconds for me (from the moment I click the page). Like I said, it might just be my computer. Never buy the cheapest one... I'm still enjoying the Words section though. I have the new tab and it seems to be a simpler version of the old vocab tab. It seems okay but you can't search for a word, but other than that it seems fine! To search for a word, use the Search-function of your browser (Ctrl+F). The list was not there when I started my learning and I like it a lot! Then you would have LOVED the old version. As a programmer myself I feel the Duolingo team's pain. Oh, so many times have I heard "just copy and paste this code over there", as if things were that simple. The work that the small Duolingo team has put over different platforms, including back-end changes for the incubator and everything else, is amazing. Don't let the average user tell you otherwise ("it's a joke", "took them six months for that", "the excuse is wearing thin"). Of course they will complain, that's what users are for! :) Just keep the good work and take the feedback with a thick skin. I'm in my mid 40s and have spent the majority of my adult life as a developer and project manager on multiple platforms and a variety of languages. I stand by my choice of words. I have been in a start-up. Our CEO that time had terrific ideas to be done first thing. Only, we 'poor' developers had other priorities, like fixing bugs. Once we convinced our CEO (also a Ph.D. in Computer Science, by the way) to be, well, just the CEO (get money, venture cap. etc. ), we hired a professional project manager. Springing new ideas to us never (directly) occurred anymore. They were run by project management, CTO, the development team (seniors and juniors alike, though, for input about technology and feasibility). Our CEO hadn't liked the idea to be 'degraded' to be CEO. A few weeks later, he said, is was the best advise ever! So, maybe there is a little lack of project management as well as public relations. You can't advertise a feature coming back in a "different" way and not assuming users take this as "coming back with improvements". Great story, raans, a very good example in this case. Thanks, Larisa. I already had a more elaborate answer. I accidentally scrolled up/down, and it was gone. Anyway, long story short: the CEO does business, the CTO tech, the project manager (well, self-explanatory), and the dev team implements stuff, preferably in modern, agile methods. Thank you Duolingo staff. You are very much appreciated for this addition, as well as for the entire website. I am getting a lot better at understanding Italian and I don't think that I would have ever made the attempt without Duolingo. And now I can work on vocab!!! I wish I was in the test group! I am so excited that I am in the test group too! Thank you Duolingo for adding this feature! It appears the SRS tracking of words is pretty broken. Today I chose to practice weakest on my words list. I was quizzed about drinking coffee and water for at least 1/4 of the questions, which are from early units and full strength (4 bars). On the other hand, items that have one bar did not show up. So it is, as it was before the removal and since re-implementation, broken. Please Duolingo, I need this feature to "practice weakest words" in mobile app. It's the only thing I'm missing! Hi, I noticed this post from 4 years ago. Why wasn't there added gender of nouns by now? And why can't I see Practise Words button as you have? I don't see this section yet. When will everybody have it ? And what is about the tablet version, those who use duolingo on android, like me ? It's only a beta test right now. No one knows how long this process will last, or when it'll be released to the general community. So after the beta they may release some extra perks along with it? Not necessarily. They could tweak it due to feedback, release it as is, or dump it into the "never-be-seen-again" bin.. I guess i am glad that it is "back" for you, but oh so sad that it doesn't appear anywhere on my page. para cuando en la version en español? Nice to see that it is back. I don't have it yet but maybe it's not for all users or languages yet. Hi I have words - how is the list of words organized? the list does not appear to be in alphabetical order? Are they approximately in the order that we learned them? thanks - this should help me with the fuzzy words or words I get mixed up with similar words. You can click on the headers to resort, but by default they're sorted by most recently practiced. Sorry, but I don't see this page. I logged out and signed in again, but I can't see it. I am learning German. ¡¡¡FINALMENTE!!! After such a long wait. At least thank goodness they listened to all the complaints and brought it back. Of a truth, a some of the very useful features are not there, but let's keep our fingers crossed. Hopefully, they'll add them as time goes on. Why can't I have a words bar? How can I find the vocabulary list? It would really help me. It's pretty useful, although a question to one of the devs: Does the 'practice weakest words' button do the same as the 'strengthen words' button that is on the home screen? Or does the primary practice just the weakest words, whereas the latter might do weak lessons or random lessons instead? Well, the both link to https://www.duolingo.com/practice, so it seems they do the same thing. In the previous version of the vocabulary tab/duolingo, the button on the home page and on the vocabulary page did the same thing. I don't have the new 'Words' tab yet, so it's good to know what it involves. I'm pleased to see them listening to the community and making an attempt to reintroduce vocabulary. However, the thing I used to love about the vocab tab was the ability to practice a specific word that I was having trouble with. If I do the lesson it came from, then the bulk of the questions will have nothing to do with the problem word. So, while I still hope that one day they will bring back the ability to practice a specific word again (I don't know about others, but my progress has slowed RIGHT down since they removed that) - this will still be an improvement on the current vocab-free setting that I have been working with. So, I look forward to receiving the update if when they roll it out more widely. Your screenshots and descriptions are much appreciated! There seems to be a user named "words". You can find him using the search tool. But you can't visit his profile page... instead, you get to the vocabulary page. Which probably means that either there's a user who can't visit his own profile page, or Duolingo created a fake account to prevent that from happening. I don't know which. @TimothyGeek, one or more people have been having a spot of fun by taking official Duolingo page names and making them into usernames (unless Duolingo reserved them). The difference is whether someone writes http:// before the url or not. That will determine if you get to the user profile or the official page. And when will it be avaliable for all the users? Please add this feature to all languages. I see this for French, German and Spanish, but not my primary learning languages, Dutch and Turkish. How do you search for words? Hi there I think this is a great idea to have a list of words to practice BUT it would be great to have the english there too. Really appreciate you taking the time to gather feedback. I think it doesn't help me much. I see some words on mine that show they need practice or are already decaying when I only used them the previous day. Others, I haven't used in a month and they still show strong, so what's that all about.? Is this feature still unavailable, after all this time? Is DuoLingo working on a solution? Expanded information on verb conjugations, article uses, genders, etc. 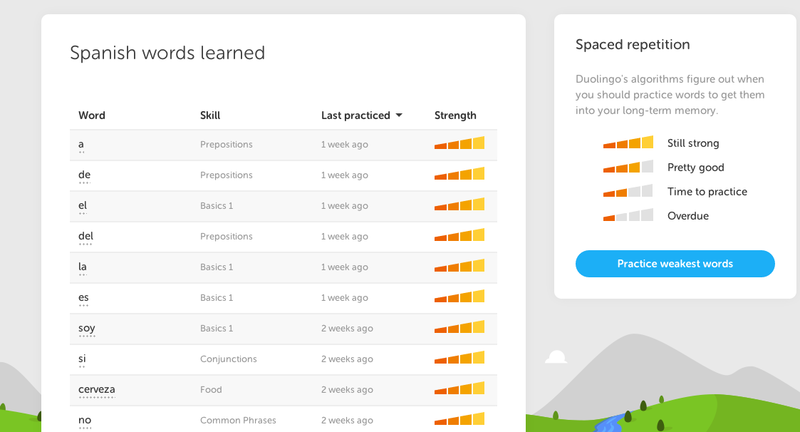 automatically compiled based on your learning would be wonderfully complementary to what DuoLingo offers now. This piece is missing from a complete language education on Duolingo. Is it really so difficult to implement a way to practice the new vocabulary of your latest session ... ? Hi Heer_General, could you guide me how to access this? I got to labs > duolingo dictionary but there i only have a "search" box. thanks ! I see that the word list has changed again and I don't see the functionality being any better, not being able to find out where the word in question is so I can practice it is frustrating. Your weekly progress is back!